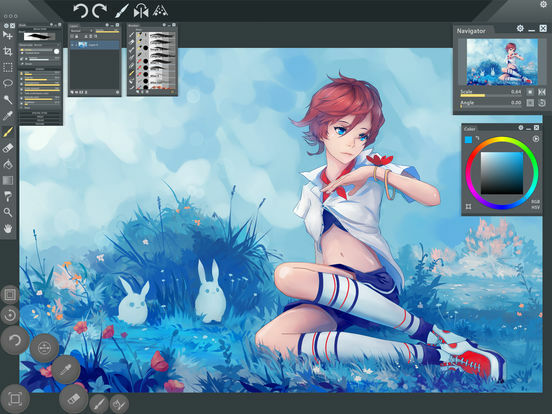 Bring the process of digital painting to a new level! 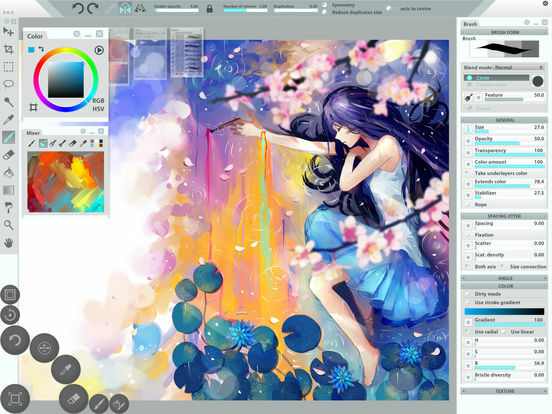 Paintstorm Studio 1.72 (Win&Mac) was available as a giveaway on February 18, 2017! 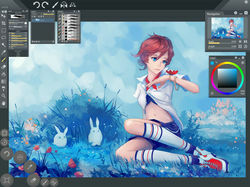 Paintstorm Studio is one of the best painting tool designed not only for simple sketches, but professional digital painting of any level, genre and technique. 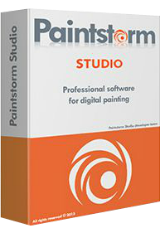 A major feature of Paintstorm Studio is the array of brushes to choose from. We did our best so that you can easily and quickly adjust the brushes suitable to your painting style. Anyone who has ever painted knows it's hard to overestimate the painting tool and the importance of all the seemingly insignificant details. We tried not to miss any of them. Our goal was to create an intuitive, simple-to- use but at the same time functionally powerful tool that brings the process of digital painting to a new level, making it as comfortable as possible. Please note: the program includes the two months license! How would you improve Paintstorm Studio 1.72 (Win&Mac)? download, install & register, then run the s/w, no problem as in win10 x64 os. could be my notebook meet the setup condition. today, this is the 2nd offer i downloaded, because it meets my need. all the while, i want to try something like this type of painting. now, this is a good chance, even given a 2-month life, it is ok to me. Looks like a nice, easy to use program! Are the devs going to offer a "Special price for GAOTD users"? I love the interface and the fact that you can start working/playing the minute it is installed and activated. The downside is the 2 month license, which is understandable considering this application isn't the primary "Giveaway of the Day" for today. Thanks GOTD and all you good folks for the comments. I love the interface and the fact that you can start working/playing the minute it is installed and activated. The downside is the 2 month license, which is understandable considering this application isn't the primary "Giveaway of the Day" for today. Thanks GOTD and all you good folks for the comments. Mavadelo, Ahhh, I understand what you are saying. I'm still in the learning curve about all this technology so I greatly appreciate all the feedback and comments from everyone. I guess I just believed there is a primary GOTD and that app will be totally free with no restrictions and any other software offered in addition to that is gratuitous. I actually thought the first app on the daily page or in the email I receive daily is the primary, but now I stand corrected because of the point you just made. Anyway, I only wish the Paintstorm would have been the totally unrestricted software. Mavadelo, Ahhh, I understand what you are saying. I'm still in the learning curve about all this technology so I greatly appreciate all the feedback and comments from everyone. I guess I just believed there is a primary GOTD and that app will be totally free with no restrictions and any other software offered in addition to that is gratuitous. I actually thought the first app on the daily page or in the email I receive daily is the primary, but now I stand corrected because of the point you just made. Anyway, I only wish the Paintstorm would have been the totally unrestricted software. Thanks again Mavadelo. CPU usage is excessively high. The processes uses significant amounts of CPU when idling and excessive amounts when just drawing with the default brush and colour on a blank sheet... unusable in my opinion. Says I have a missing file....MFC140.dll How do I get that? This is an amazing piece of software. For $19. I don't paint, but I have to imagine that anyone who understands the hundreds of options available will be excited to have a program capable of so much. The people complaining about the license confusion are missing the point. The way this usually works is: the program continues to work forever, but certain privileges reserved for license holders do not. The point of giving a fully-functional copy away is to interest would-be buyers, not to satisfy curious experimenters who worry about logistics rather than functionality. 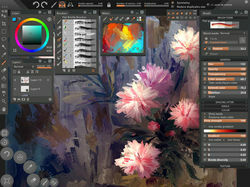 If you are truly interested in using painting software I can't imagine that you would decline to use this one, for free, because eventually it might cost you $19. Painters spend hundreds of dollars on brushes, paints, canvasses, etc. A piece of software like this is a tremendous bargain. This is an amazing piece of software. For $19. I don't paint, but I have to imagine that anyone who understands the hundreds of options available will be excited to have a program capable of so much. The people complaining about the license confusion are missing the point. The way this usually works is: the program continues to work forever, but certain privileges reserved for license holders do not. The point of giving a fully-functional copy away is to interest would-be buyers, not to satisfy curious experimenters who worry about logistics rather than functionality. If you are truly interested in using painting software I can't imagine that you would decline to use this one, for free, because eventually it might cost you $19. Painters spend hundreds of dollars on brushes, paints, canvasses, etc. A piece of software like this is a tremendous bargain. U sound like the developer???!!! Charles Basner, U sound like the developer???!!! However, a 2 month license means trial-ware to me. I am grateful that GAOTD is making an effort to tell us it's got a limited life. Sadly, I've had to uninstall a number of FREE GAOTD "giveaways" which were not advertised to die but they expired when I finally needed to use them. I'd love to download and use the heck out of it.... However, a 2 month license means trial-ware to me. I am grateful that GAOTD is making an effort to tell us it's got a limited life. Sadly, I've had to uninstall a number of FREE GAOTD "giveaways" which were not advertised to die but they expired when I finally needed to use them. Sorry for my confusion but the whole 'free today' contradicts the 'Please note: the program includes the two months license!' footnote. So is this the full featured program, or am I suddenly going to have problems saving/loading my work in 2 months ? Sorry for my confusion but the whole 'free today' contradicts the 'Please note: the program includes the two months license!' footnote. So is this the full featured program, or am I suddenly going to have problems saving/loading my work in 2 months ? Nothing is mentioned about license terms (commercial/non commercial usage) or Do and Don't. Like other GOTD also no customer support no update etc. Please explain. Ari, the readme.txt inside the downloaded zip file says "strictly non-commercial usage". The download has failed twice, the first time after 37 MB, the second one after 34 MB. It seems like a nice program but two 'buts': (1) Microsoft gives an Smartscreen warning about the setup file; and (2) it is not suitable for 4k screens like on my laptop, the program opens up full-screen but everything is really, really tiny. So I'll have to pass on this one, too bad. About the registration, I am somewhat confused because, the text in the zip file states that it offers only 2 months license. It asked for only email-id and it did not show register screen and did not nag for registration thereafter. 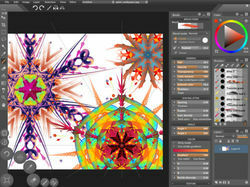 As for the program, brushes are very responsive and as soon as you launch the program you are ready to go. I like the interface. Is there a way to increase the font size of the different panels and menus, I am unable to read anything its just way too small for these old eyes. Also am I understanding right, that it's only good for 2 months? Every piece of software has a learning curve to it. A 2 month license isn't worth my time trying to learn Paintstorm! Thanks to GOTD, but I'll pass on this offer. Jim C, If you're not new to digital art you can pick up this app and be on their way in a mater of hours. Hell I'm primarily a Clip user and I'v been drawing fine it Paintstorm since this morning. Looks very nice but when tried to install the software, I got a message 64 bits OS only. Too bad I couldn't try this software. Looks very nice but when tried to install the software, I got a message 64 bits OS only. Too bad I couldn't try this software. jugem, Same here, its for only 64bit version. Too bad, this software looked promising. But there always is Adobe Photoshop. Choose the text link "Download Paintstorm Studio for Windows(x86)"
I have just downloaded and installed the trial version of 32 bit on my Win 7 OS, but just like you said, it does not allow email registration at all and when exit, it closed software as well. However, if you select "try" software starts. I'm not quite sure how limited this trial version is compare to today's offer or how long if will run. Thank you for info TK, I have just downloaded and installed the trial version of 32 bit on my Win 7 OS, but just like you said, it does not allow email registration at all and when exit, it closed software as well. However, if you select "try" software starts. I'm not quite sure how limited this trial version is compare to today's offer or how long if will run. momo, TK has given us different download link down here. jugem, yes I tried the software, loaded a PSD and drew on it then saved and no watermark... created a new image and drew some scribbles on it and saved that too and no watermarks so looks like it's just nagware with the register nag box but no enforcemeent yet... but as mentioned elsewhere its GUI uses up too much CPU to be usable on my main system. Do you mean "is limited to" a two months license? If yes, what is the difference between this and a trial? This giveaway "includes" a two months license... Do you mean "is limited to" a two months license? If yes, what is the difference between this and a trial? In many ways this GOTD remind me of painter I had a decade ago. What's the 2 months license mean? a watermark later? In many ways this GOTD remind me of painter I had a decade ago. What's the 2 months license mean? a watermark later?